The Wobbly water mat was introduced in the outdoor environment at Johnson House Preschool and has been enjoyed by the children. Sensory experiences are an integral part of the program, helping children to develop an awareness of their bodies and senses associated with them. Sensory play includes any activity that stimulates a child’s senses: touch, smell, taste, movement, balance, sight and hearing. Such experiences facilitate exploration and naturally encourage children to use scientific processes while they play, create, investigate and explore. The children have been inventing games, using trial and error to explore skills in balance and movement. This space has helped children to be aware of others and also join together in a mutually enjoyable experience. Johnson House have recently added a lightbox to the program of activities. 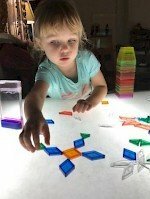 The children have been curiously investigating the light box, using provisions such as coloured cups to stack, build, balance and problem solve. Coloured water timers have been incorporated together with transparent shapes, allowing the children the opportunity to create pictures and patterns. This open-ended space helps children of all ages and abilities to join in the play and develop a range of skills. Part of the Murray House philosophy is that it is not only important for children to feel that they belong, but are also important participants who are involved in the curriculum decisions. For example, this week, the children were challenged to participate in the process of play dough making, where the importance of measurement was brought to their attention. At the same time, they were also asked to observe the results of different ingredients being mixed together. The children performed most of the steps from the recipe (which was written and illustrated in an appropriate manner), followed by application of kitchen tools such as spatulas, and different sized baking trays and tins. 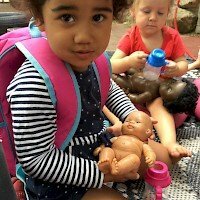 At Murray House toddlers, a caregiving experience was planned to assist in developing the children’s sense of empathy and identity around their place in the social world and their impact on others. The pretend babies were transferred to the outdoor environment and the children were shown some different equipment and objects necessary for quality caregiving. In particular, educators modelled some caregiving behaviour to challenge the children’s thinking and bring to their awareness how thoughtful gestures, touch and speech are all significant aspects of responding to an infants’ needs. At Gorton House, the centre philosophy centres on children’s rights and responsibilities and agency. Educators provide a free flow indoor-outdoor program with consistency and continuity, providing routines that are truly responsive to children’s needs. Children are provided with many opportunities to feel a sense of belonging, taking pride in their achievements, and feeling like they are valuable contributors to the daily activities of Gorton House. Educators have found that children’s enthusiasm to participate in facilitation of transition routines and practices has helped them to be more enthused, providing opportunity for connection, teamwork and learning. Involving children in all parts of routines builds strong foundations for learning, as educators use these opportunities for intentional teaching of mathematical concepts, for example by counting the number of beds needed for sleep time, or the number of bowls and cups needed at meal times. In Gorton House Toddlers, some of the children have been learning all about the animals after Thuzar introduced the Kiwi following a recent visit to New Zealand. This led to a deeper interest in ‘scary’ animals – children learned about their different body parts, how they hunted their prey and specific attributes of some of the ‘scary’ animals. Uncle Terry (an aboriginal elder) introduced an aboriginal perspective to the children by drawing their attention to specific characteristics of different Australian animals, and how aboriginal people mimic and move like these specific animals. The children were captivated by this experience and began copying Uncle Terry as he modelled the various movements and mannerisms of the animals. This month, Rigby House staff experienced the thrill of seeing and moving back into their newly renovated centre – they are truly amazed at its transformation. Even though moving back in involved days of washing windows, hauling and unpacking boxes, scrubbing toys and moving furniture, the team all feel reinvigorated by their beautiful, fresh surroundings and are excited to welcome new and existing children and families back into Rigby House’s inspiring spaces on Monday. 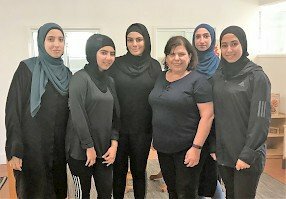 We were lucky enough to have volunteers to help with the finishing touches, including a keen group of high school students from Al Zahra College, who helped move, unpack and remove boxes and paint poles! Educators at Robinson House have been examining the potential for learning opportunities and enrichment of every day routines, such as meal times – looking at how to enrich language, connection and a child’s sense of belonging. 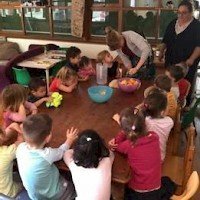 Children and educators have been discussing where food comes from and how it gets to them, which led to an experience in producing orange juice. The children were involved in planning the process, and used art to explore their ideas and make a “list” of all the fruits they wanted to explore further. Educators and children in care across all four of our hubs celebrated Chinese New Year this month. Lulu & Gladys came together with their small groups of children to acknowledge Chinese New Year. The children decorated their own kites and later discussed photos of traditional dancing Chinese Dragons. 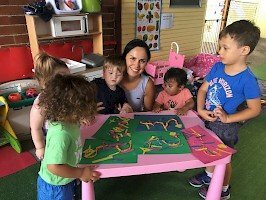 In Family Day Care in the Inner West, children have been engaging in role play – creating a car wash facility with some ride on toy cars. A child drove the car up into the car wash facility and all children had water spray bottles and cloths which they used to clean the car. The children showed great attention to detail in cleaning the doors and trimmings, examining the car thoroughly together and pointing out areas that needed to be re-cleaned. Doors were opened and the boot was opened to ensure the car was perfect.